Kids Woot! is owned and operated by Woot Services LLC. 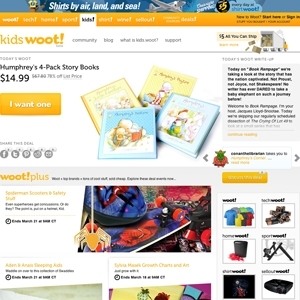 Unlike the main Woot site, which offers deals on general merchandise, Kids Woot! only offers deals on children's items; which includes everything from clothing, toys and more (even snacks at times). Of course the business model remains the same; they offer a highly discounted deal once a day. Kids.woot.com currently ranks #12 amongst sites offering online deals -- DX Offers ranks #11. In the For Parents category, Kids.Woot ranks at #1. Kids.Woot is considered the most popular deal a day site, ranking in at #1. As for the 2nd most popular site, it's Giveaway of the Day. Offers specials on children's outdoor gear.